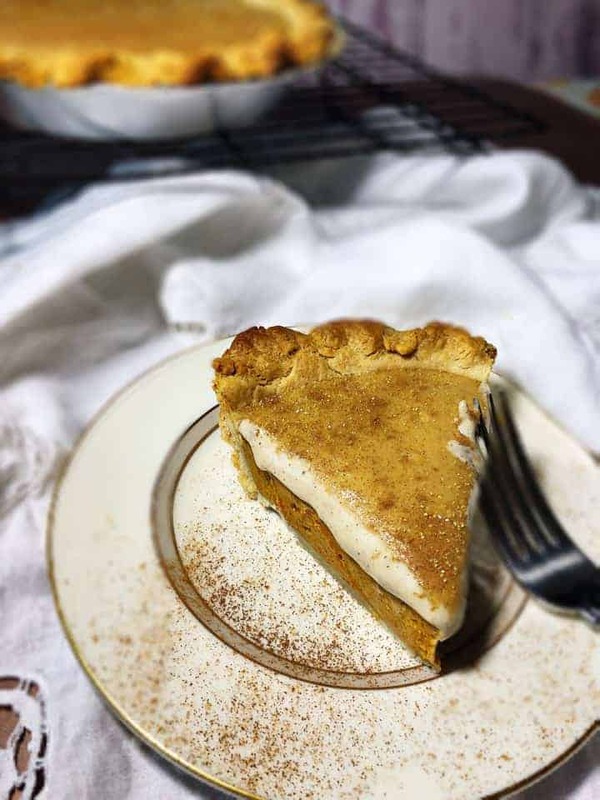 This vegan pumpkin pie is creamy, smooth, and bursting with the traditional pumpkin pie flavor. 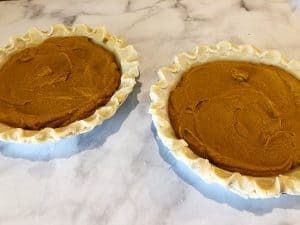 It’s easy to make because you can use a prepared (vegan compliant) pie crust and canned pumpkin. This pie has a fancy addition though: a second layer made of cinnamon cashew cream. Discloser: This post contains affiliate links. 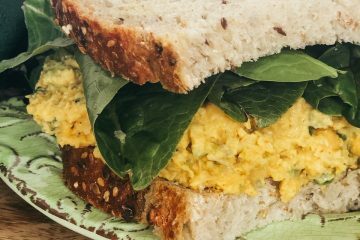 Clicking on these links and purchasing may earn Veggie Fun Kitchen compensation at no additional cost to you. I remember my first vegan Thanksgiving. 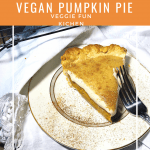 I made it my goal to make all the yummy traditional sides and desserts my way – the vegan way. 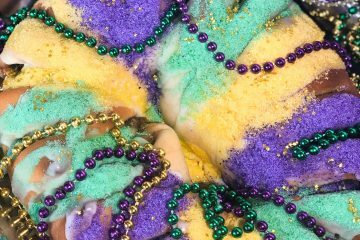 (Aren’t the sides and desserts the best part anyway?!?) 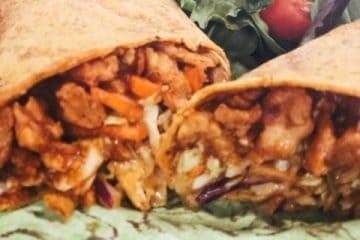 I was so excited to prove that we could still have a traditional seasonal meal and still eat vegan. Most were a success – except for the Watergate Salad (still working on that one), and the pumpkin pie. 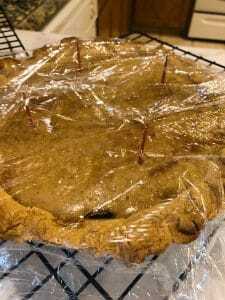 In fact, I remember my disappointment when I excitedly cut into my soupy goopy vegan pumpkin pie mess- because some things just NEED eggs to help set up! Or do they?I tried the flax “egg” and the aquafaba “egg”; but both were abject failures. 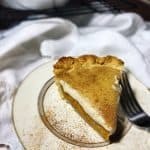 The cinnamon cashew cream used in this recipe is not a “light and fluffy” type of topping but more of a second layer to the pie. It adds a subtle nutty flavor and is the perfect topping for this pie. PLEASE! YOU MUST DISCLOSE TO ANYONE EATING THIS PIE THAT IT CONTAINS NUTS! Nuts are not a common ingredient found in pumpkin pie. A person with allergies might not be aware if you do not fully disclose. 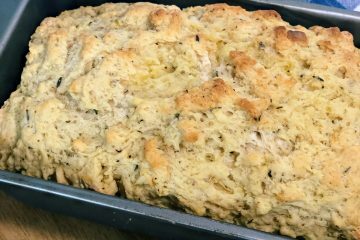 Never try to pass vegan cooking off as non-vegan – especially if the item contains potential allergens. Start by preheating your oven to 375° and soaking the raw cashews (affiliate link) for about 30 minutes. 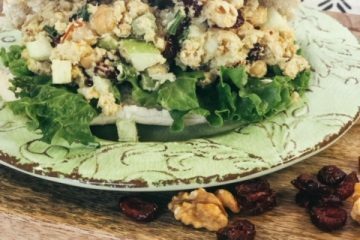 If you can only find roasted cashews then you will need to add hours to your soaking time and rinse well to remove the added salt. 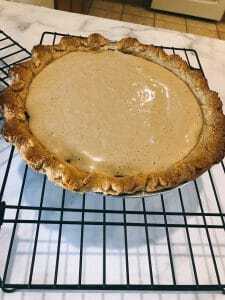 I use a prepared pie crust. Feel free to make your own. There are many recipes for a more “plant-based” crust – but for a special seasonal meal, I prefer the traditional type of crust. Just read the ingredients to ensure the crust fits in with your way of eating. Set the crust, if frozen, on the counter to thaw while you are preparing the filling. 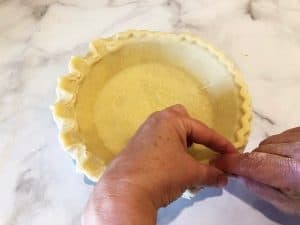 One trick I learned from my mamma to make your store bought crust appear more homemade, is to pinch or flute the thawed edges like you would if you made the crust yourself. Tricky tricky. Gently pinch to give a fluted edge. Make sure to drain the water off from the soaked cashews. 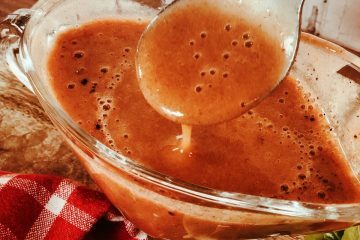 Add to a high speed blender (affiliate link) along with the other pie ingredients and mix on high for 3-5 minutes or until cashews are thoroughly blended and mixture is smooth. Make sure to buy SOLID pumpkin NOT the pumpkin pie mix. That has other ingredients in it and your recipe will not turn out the same. 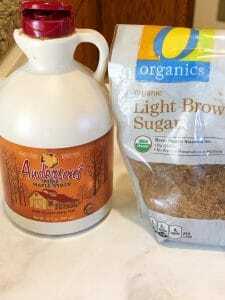 Brown sugar and real maple syrup are used for the sweeteners. 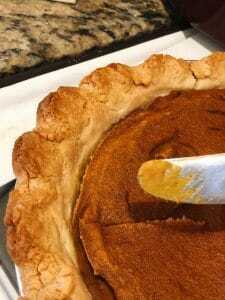 Pour and scrape the pumpkin pie mixture into two prepared unbaked crusts. Spread evenly with a spatula. I used an eight inch deep dish shell for my pies. 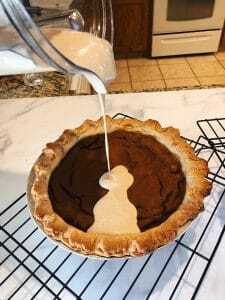 Depending on the size of the pie shell, the pie mixture may not come to the top. Remember, you will put a second layer of cinnamon cashew cream on top after it’s baked and cooled. While the pies are baking, begin making the cashew cream. Start, of course, by soaking the cashews for about 30 minutes. While they are soaking you can wash your high speed blender. You know the trick for that right? If not, then enjoy this quick little video from Raw Blend. Drain the cashews and add to your clean blender along with the other ingredients. 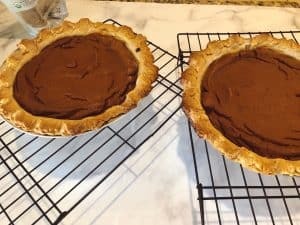 Pour into a jar or container and put in the refrigerator or just set aside while the pies are finishing cooking and cooling. After 50-55 minutes the pies should be done. The traditional “knife test” is not going to work for this recipe. The top will be darker and there might be some cracks on top. When you give it a gentle wiggle, it will be mostly firm-ish. The pies will firm a little more as they are cooling. Set on a cooling rack to cool. When you can handle touching the pans, you can put into the refrigerator. Once the pies have cooled sufficiently, pour the cashew cream on top and carefully spread. Sprinkle with a little cinnamon and sparkly sugar if desired. If you cover with plastic, use toothpicks to keep the plastic off of the cashew cream. Soak raw cashews for about 30 minutes. Discard water after soaking. 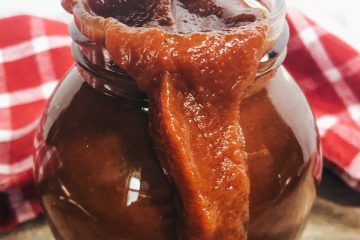 If you use roasted cashews, you will need to add hours onto the soaking time and then throughly rinse salt off before using in recipe. Pour/scrape into two uncooked pie shells. Smooth the tops. Cook in a 375° oven for 50-55 minutes or until crusts are browned, top of pies are darker, and cracks may appear. The clean knife test will not work for this recipe. Take out of oven and set on a cooking rack to cook. 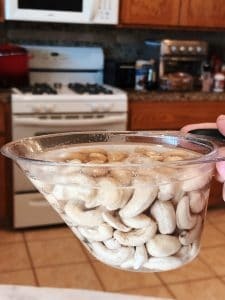 While pies are cooking and cooling, soak raw cashews for about 30 minutes. If you use roasted cashews, your soak time will increase by hours and you must rinse thoroughly to remove salt. After cashews are soaked, drain water off. 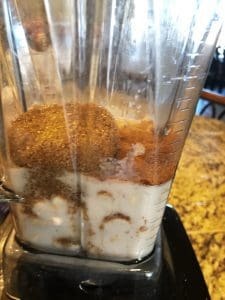 Place soaked and drained cashews into clean high speed blender along with cashew milk (or other plant milk), lemon juice, cinnamon, salt, and brown sugar. 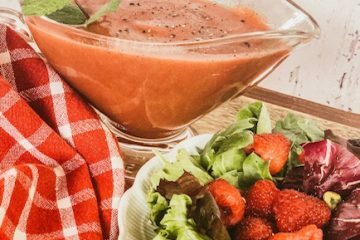 Blend at high speed until smooth and creamy. 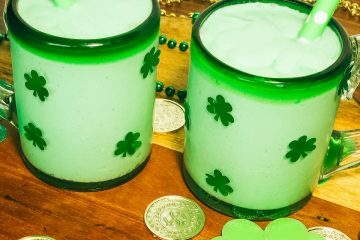 Set aside until pies are cooled -or if you have finished extra early, pour into a jar and refrigerate. 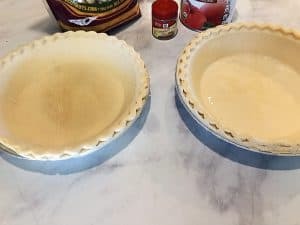 Once pies have cooled, pour evenly on top. Top with additional cinnamon and perhaps some sparkly gold sugar. In my humble opinion, this is best served cold. The cashew cream will firm up with refrigeration. If you like your pie warm though...to each his own. 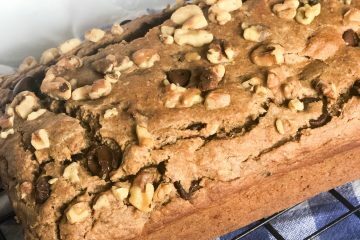 You must disclose to anyone who may eat this pie that the recipe contains nuts. Pumpkin pie typically does not contain nuts so this is especially important.